General Hospital (GH) spoilers tease that some major bombs will drop in Port Charles. February sweeps is coming up and that means several PC residents will face chaos. We’ve got a preview for you, so let’s dive in and see what’s ahead in all the main storylines. For starters, Kristina Corinthos-Davis (Lexi Ainsworth) will inch further away from her family. As a result, she’ll also inch further into Shiloh Archer’s (Coby Ryan McLaughlin) web. General Hospital spoilers say we’ll learn more about Kristina’s friends at the community house. They’ll play a role in sucking Kristina in to their world more and more. This cult will bring on crisis as Sam McCall (Kelly Monaco) frets over what to do. Fortunately, Sam will have Jason Morgan (Steve Burton) right by her side. They’ll choose to stop wasting time and be the couple they’re meant to be. GH spoilers say Jason and Sam will take care of each other during February sweeps, but don’t be surprised when some obstacles hit. As for Shiloh, he may have another stunning connection on canvas. We know Margaux Dawson (Elizabeth Hendrickson) has a surprising link to someone else in Port Charles. Shiloh seems like a good option since his real name is David Henry Archer. Margaux called her ex-husband “Dave” when she mentioned him to Drew Cain (Billy Miller) – and like Shiloh, Dave was obsessed with his inheritance. Will the DA throw off Shiloh’s plans a bit? Time will tell, but a rattled meeting could be coming up. Meanwhile, Mike Corbin’s (Max Gail) decline will bring Corinthos clan drama. They’ll have a hard time watching Mike slip away. Sonny Corinthos (Maurice Benard) and Carly Corinthos (Laura Wright) will process this differently, so it could lead to some bumps in the road. Over with Dr. Hamilton Finn (Michael Easton) and Robert Scorpio (Tristan Rogers), they’ll team up to get answers about the virus Anna Devane (Finola Hughes) contracted. A big adventure story is brewing, so that should be interesting. However, things will remain incredibly dangerous in Port Charles. Ryan Chamberlain (Jon Lindstrom) will make sure of that! Since it looks like Lulu Falconeri (Emme Rylan) will be severely injured soon, that should become a huge part of the February sweeps mayhem. Lulu’s loved ones will hope for her recovery while Ryan keeps running amok and Dante Falconeri (Dominic Zamprogna) remains who knows where. He’s deep undercover, but it appears he’ll actually go missing at some point. 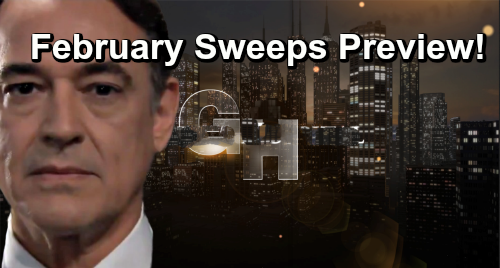 General Hospital buzz is that Ryan won’t make it past the end of February sweeps! Other General Hospital spoilers say Willow Tait (Katelyn MacMullen) will be drawn to “Wiley” Cooper-Jones. She believes “Wiley” is her son, but he actually belongs to Michael Corinthos (Chad Duell). Of course, Michael doesn’t know Brad Cooper (Parry Shen) swapped his dead baby for Nelle Benson’s (Chloe Lanier) bundle of joy. Some intriguing clues could surface during February sweeps. Despite Willow’s growing feelings for Harrison Chase (Josh Swickard), she’ll connect with Michael emotionally. He’s “Wiley’s” godfather, so that’ll certainly be part of why Willow wants to bond. Finally, Oscar Nero (Garren Stitt) will march closer to his inevitable death. Dr. Terry Randolph (Cassandra James) warned that Oscar may only have six weeks left, so his condition is about to get much worse. General Hospital spoilers say some gripping moments are in the works. We’ll give you updates as other GH news comes in. Stay tuned to the ABC soap and don’t forget to check CDL often for the latest General Hospital spoilers, updates and news.